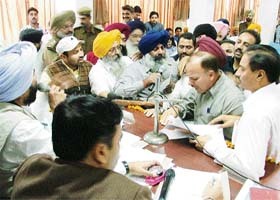 The shadow of the forthcoming Assembly elections loomed large on the General House of the Ludhiana Municipal Corporation today that unanimously passed 15 items out of 21 amidst commotion and unruly scenes. With the model code of conduct likely to come into force in the run-up to the elections, all councillors wanted their issues to be resolved today only, as this could be the last meet. Councillors argue at the General House meeting of the Ludhiana Municipal Corporation on Thursday, here today. Jagminder Singh alias Aman Verma, held in the sensational Vikramjit murder case and kidnapping of Chandigarh youth, Nikhil Joshi, was ‘dead’ for long for his illustrious family members. Jagminder, alias Aman Verma, whose family has distanced itself from him. The city police today dispatched teams to Delhi and Jaipur to catch several other accomplices of the three accused who were nabbed yesterday in the Vikramjit murder and Nikhil Joshi kidnapping case. The District Administration and local police today launched massive anti-encroachment drive in the Mini- Secretariat, Judicial Complex and Lawyers Chambers Complex. 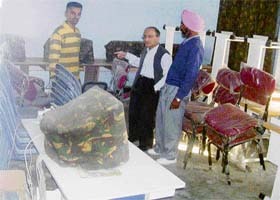 Seeing police officials, the encroachers were seen running with their belongings. Migrant labour plays a positive role in economic development of Punjab. For the estimated 25 lakh to 30 lakh migrant labourers, mostly from Bihar and UP, Punjab is a "home away from home". The fixation of minimum support price for sugarcane at Rs 132 by the Punjab Government is a decision taken under the pressure of private sugar lobby of Punjab. This was stated here today by Mr Balbir Singh Rajewal, president, BKU, Punjab, at a press conference. The Parliamentary Secretary, Power, Labour and Employment, Mr Surinder Dawar, claimed that the Congress Government headed by Capt Amarinder Singh had created a record by fulfilling all 66 promises made in its poll manifesto and had put the state on the fast track of development and prosperity. A four-day annual Gurmat Samagam will start at Gurudwara Nanaksar, Samrala Bypass, here from November 24, under the aegis of Sant Baba Jaswant Singh Ji to propagate the spiritual teachings of the great gurus, to foster universal brotherhood and to pray for world peace. Hundreds of inhabitants of village Hissowal, including some NGOs, are irked over the ‘faulty’ sewage project which, they claimed, was against the norms laid down by the Government of India. The state body of the Bairagi Maha Mandal, Punjab, has been dissolved by Mr Ravinder Nandi, secretary general, under the directions of the national president, Mr Krishan Kumar Bawa. The Department of Higher Education, Punjab, in collaboration with the Punjab Infotech has introduced a programme- Punjab Training on Soft Skills - in 25 government colleges of the state to provide basic training to students to face Business Processing Outsourcing culture. The village that emerged as pioneer in being adopted by Canadian International Development Agency for improving life of its residents three years ago failed to impress upon the authorities to post sufficient staff at Government Senior Secondary School. The Panchayat of Chhapar village near here presented woollens and shoes to the needy students of Government High School at a function presided over by Mr Jagdish Singh Garcha, MLA, Kilaraipur. The Punjab Technical University has released the merit list of BCA and MCA (Regular) examinations held in May 2006. The students of Khalsa Institute of Management and Technology for Women have done well in these examinations. The District Bar Association President, Mr Naval Kishore Chhibber, today strongly refuted the allegations levelled against him by the Secretary of the DBA, Mr Rajneesh Gupta, terming the same to be baseless. He said the annual elections of the DBA were going to be held next month. Tobacco use is a serious public health challenge in several regions of the world. It has assumed the dimension of an epidemic resulting in enormous disability, disease and death. The World Health Organisation considers tobacco to be the singlemost important cause of preventable deaths worldwide. 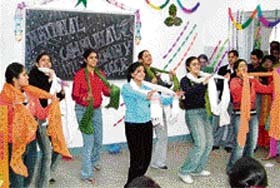 The medical and nursing students of Dayanand Medical College and Hospital today participated in the Flag Day celebration, which was a part of week-long 'communal harmony campaign and fund-raising week', observed under the aegis of the National Foundation for Communal Harmony from November 19 to 25 every year. Excelling in pace and power, the Western Railway, Mumbai, yesterday defeated the Central Railway, Mumbai, 3-1 to clinch the title in the 10th All-India Mohinder Partap Singh Grewal Women's Hockey Tournament. A team from the National Basketball Association of America will visit Jarkhar village on December 10. The team will be in the village to monitor the rural sports culture in Punjab. Top wrestlers of the region would be seen in action during the Hind Kesri Dangal to be organised by the Rustam Club here at the PUDA ground, Phase II, Dugri, on November 26.